Creating a competitive culture in your call center will improve agent performance. Increased motivation can be the result of social pressure from peers and managers, whether it comes from a desire to get top bragging rights, or due to public pressure placed on under-performing agents, a Wallboard application is a great motivator. 3CX Competitive Wallboard enables agents and managers to clearly see who the top performing agents are, and where each agent ranks compared to their peers. A wallboard encourages agents to produce beyond simply hitting their minimum quotas. 1.1. What is 3CX Competitive Wallboard? 3CX Competitive Wallboard is an agent performance monitoring application that encourages a competitive spirit among the agents by displaying the performance ranking data for the day, week and month. Managers can create agents, set profile pictures, edit daily, weekly and monthly quotas, activate or inactivate agents, and export report information; while agents can only view information. 1.2. Why 3CX Competitive Wallboard? 1.3. How to use 3CX Competitive Wallboard? To include an agent’s performance in the ranking data, you need to create an agent, associate the agent with a 3CX extension, and set quotas for the day, week and month. The agent will then be ready to start calling your customers. With 3CX Competitive Wallboard, a manager can set/edit the agent’s quota, activate/deactivate an agent, edit the agent’s profile picture, and export call log data in one of several available document formats. • Install .NET Core SDK. For this, go to link, https://www.microsoft.com/net/download, and then, from the Windows section and under .NET Core, select Download .NET Core SDK and install the software. 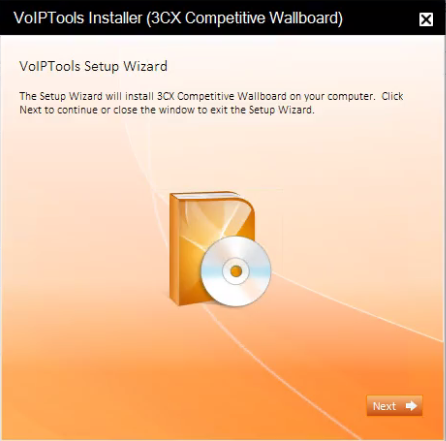 You can order 3CX Competitive Wallboard on-line at http://www.voiptools.com. Your order confirmation email will include your license key and a link to download the software. 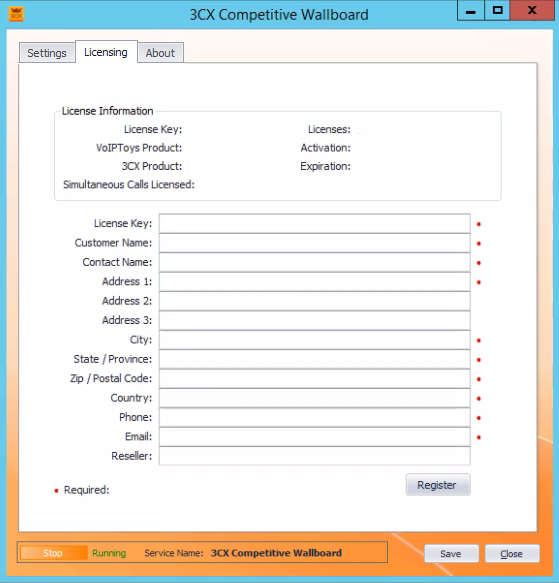 You must register your license key to activate 3CX Competitive Wallboard. Your license key is included in your order confirmation email, and can also be found in your order history on our website. 2. 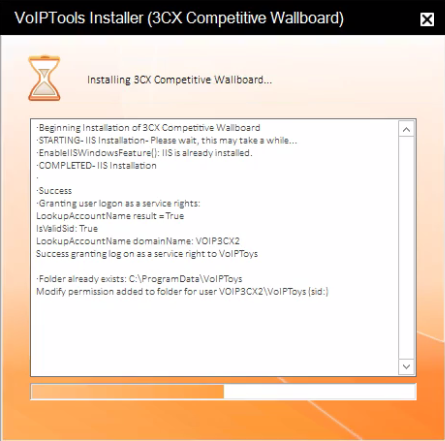 If you are installing 3CX Competitive Wallboard directly on the 3CX server, you can install the Relay simply by clicking the Install/ Upgrade Relay button and following the Relay install instructions. 1. 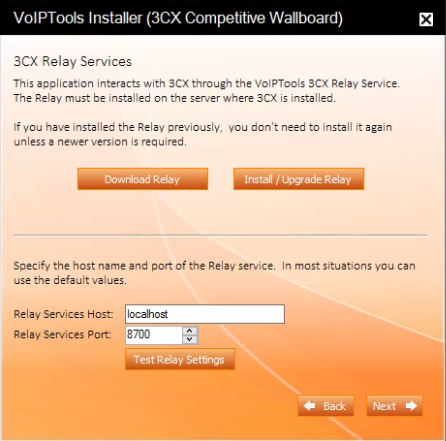 In the Relay Services Host field, enter “localhost” if installing 3CX Competitive Wallboard on the 3CX server. If 3CX resides on a different server, enter the IP address or FQDN of the 3CX server. 3. Click Test Relay Settings to confirm 3CX Competitive Wallboard can communicate with the Relay services running on the 3CX server. 4. If the 3CX Competitive Wallboard is successfully able to communicate with the Relay services that run on the 3CX server, Success message box appears. Click OK. 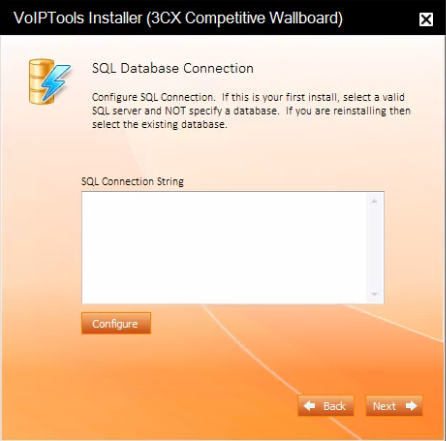 If SQL Server is installed on a server other than the server where 3CX Competitive Wallboard is installed, you will need to configure SQL Server to allow remote connections. 1. On the 3CX Competitive Wallboard configuration screen, and in the Global Settings tab, select License tab. The Check for Updates button on the Licensing tab enables you to easily download the latest version of 3CX Competitive Wallboard. If a newer version of 3CX Competitive Wallboard is available, the message will indicate that a newer version is available. Clicking the button will automatically download a .zip file of the latest version of the software. You can install the new version directly over the top of a previous version without the need to uninstall the previous version. 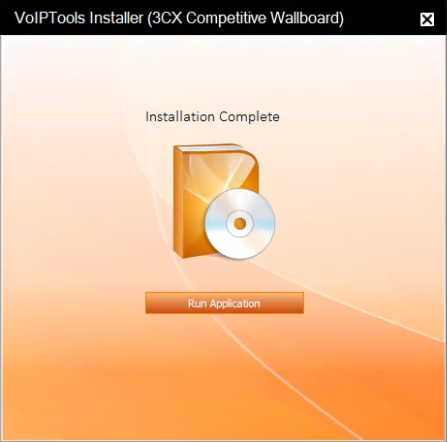 To access the 3CX Competitive Wallboard web portal, click the Web Portal button on the configuration program, or click on the desktop icon that was created during the installation process (3CX Competitive Wallboard Web). When you first install the Wallboard, all users are treated as a “managers”. 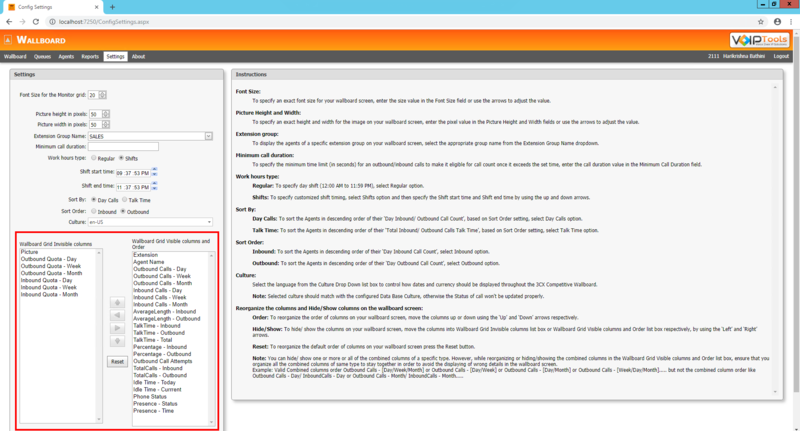 This gives you access to the settings pages where you configure the Wallboard extension group. The name of the 3CX extension group can be anything you choose, and managers of this extension group then become managers of the wallboard. Once the extension group is created in 3CX and configured in the Wallboard, then you must be a member of this extension group to access the wallboard, and you must be a manager of this extension group to make changes to the wallboard configuration. Wallboard screen displays the list of all the active agents of the saved extension group and their current call statistics. Here, you can view which agent has made the most calls and who has met their call quotas. • Wallboard screen can be viewed by agents who are assigned with either ‘Manager’ or ‘Agent’ role. • The Wallboard screen displays the list of all the agents associated to the group that you select from the Extension Group Name drop down list. o If the Sort Order setting is Outbound, then the agents will be displayed in the descending order based on outbound call count. o If the Sort Order setting is Inbound, then the agents will be displayed in the descending order based on inbound call count. o If the Sort Order setting is Outbound and if the daily outbound call count for any two agents is the same, then the agent with the highest Outbound Talk Time for the day will be displayed above the other agent. o If the Sort Order setting is Inbound and if the daily inbound call count for any two agents is the same, then the agent with the highest Inbound Talk Time for the day will be displayed above the other agent. • If an agent has not yet met their quota, their quota will be displayed in red. • Once the call quota is reached for any agent, the color will change to green. • The footer of the Wallboard screen displays the sum of outbound calls of all the agents per day/ week/ month, sum of inbound calls of all the agents per day/ week/ month, and the average percentage of answered inbound/ outbound calls of all the agents per day. • The Wallboard screen displays Idle Time data only when you select Work hours type as Shifts in the Settings page. Idle Time is an active timer that runs to display the amount of idle time of an agent during the shift hours. • Presence displays current Agent Status and the Time since the latest updated Agent Status in the ‘3CX Smart Phone’. • Day represents the number of outbound calls made and answered by an agent for the day. • Week represents the number of outbound calls made and answered by an agent for the week. • Month represents the number of outbound calls made and answered by an agent for the month. • Day represents the outbound call quota of an agent for the day. • Week represents the outbound call quota of an agent for the week. • Month represents the outbound call quota of an agent for the month. • Day represents number of inbound calls attended by an agent for the day. • Week represents number of inbound calls attended by an agent for the week. • Month represents the number of inbound calls attended by an agent for the month. • Day represents the inbound call quota of an agent for the day. • Week represents the inbound call quota of an agent for the week. • Month represents the inbound call quota of an agent for the day. • Inbound represents the total talk time of all the answered inbound calls of an agent for the day. • Outbound represents the total talk time of all the answered outbound calls of an agent for the day. • Total represents the sum of Inbound Talk Time and Outbound Talk Time of an agent for the day. • Inbound represents the average inbound talk time of an agent for the day. • Outbound represents the average outbound talk time of an agent for the day. • Inbound represents the number of answered inbound calls of an agent for the day. • Outbound represents the number of answered outbound calls of an agent for the day. • Inbound represents the percentage of inbound calls answered by an agent for the day. Idle Time is an active timer that runs to display the amount of idle time of an agent during the shift hours. The Wallboard screen displays Idle Time data only when you select Work hours type as Shifts in the Settings page. • Today represents the amount of idle time of an agent during the shift hours of the day. Usually, it is calculated as: (Total Shift Hours of the Day – Total Talk Time). • Current represents the amount of idle time since the latest call. Presence displays current Agent Status and the time since the latest updated Agent Status. • Status displays the current Agent Status. • Time is an active timer that runs to display the time since the latest updated Status. When an agent changes the status in the ‘3CX Smart Phone’, the status is instantly updated in the Status column and the Time timer starts from zero. • A manager can view and access data in all the menu options available in the Competitive Wallboard web portal. • Activate/ Inactivate an agent. • Upload new or edit picture for an agent. • View the amount of idle time of an agent during the shift hours of the day, and since the latest call. • View the current status of an agent and the time since the current status has been changed. • Set inbound and outbound day, week and month call quota for any agent. • Configure font size for ‘Wallboard’ screen. • Specify the 3CX Extension Group to monitor. • Set ‘Minimum Call Duration’ (in seconds) for an extension group so that a call can stand eligible for call count only after it reaches the set time. • Set ‘Work hours type’ for an extension so that the calls made in the set working hours will stand eligible for call count. • Set the ‘Sort Order’ setting for ‘Inbound’ or ‘Outbound’ calls in ‘Wallboard’ screen to display the agents in descending order based on their inbound or outbound call count. • Reorganize the order of columns in the wallboard screen except that the ‘Picture’ column is always the first one. • Hide one or more columns in the wallboard screen except ‘Picture’ column. • Make ‘invisible’ columns as ‘visible’ in the wallboard screen. 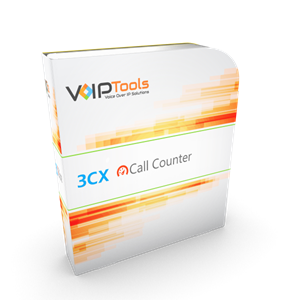 • Export call log reports in various available formats. • Create filter to search call logs of the agents for a specific day (24 hours) of the current month. • Agents can view only Wallboard and About screens. • An agent cannot edit any data. Queues screen displays various data related to Call Queues for the current day. 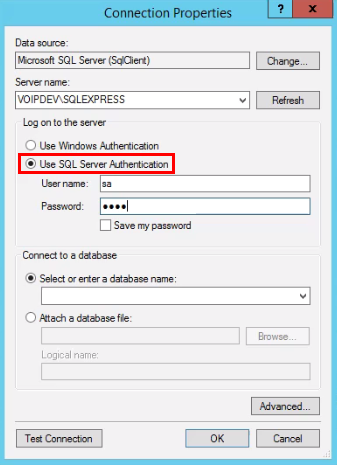 The data displayed is only about inbound external calls to the Call Queues. The Call Queue names that are displayed in this column are retrieved from the 3CX Console Management. 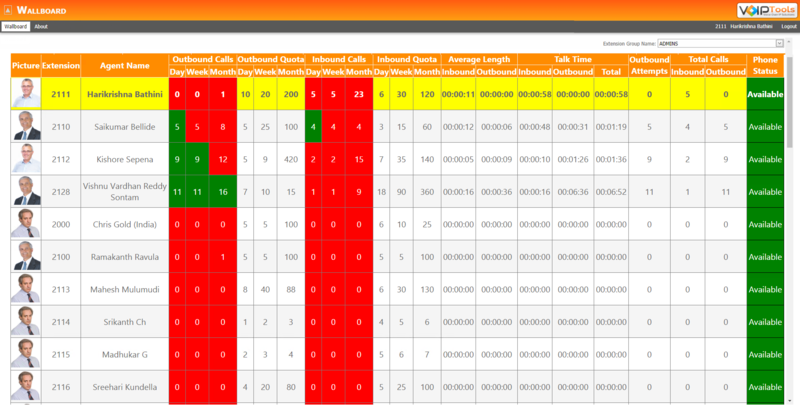 Displays the number of calls to the specific Call Queue that are in ringing stage. Displays the number of agents in the Call Queue that are active on call. 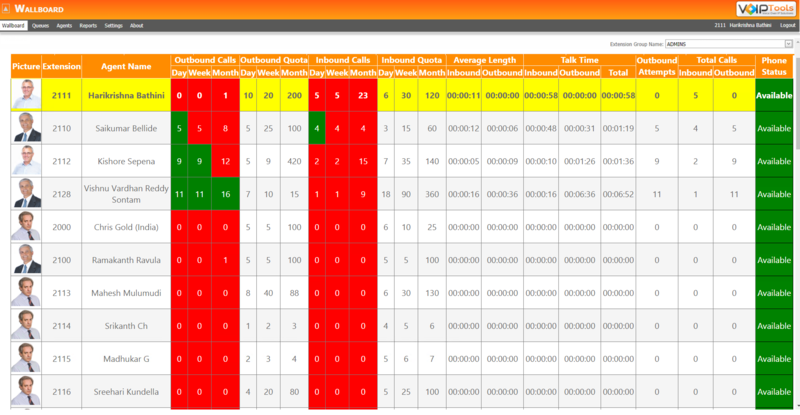 Displays the number of calls attended in the Call Queue. Displays the number of calls unattended in the Call Queue. Displays the total number of calls to the Call Queue. It is the combination of ‘Number of Calls Handled’ and ‘Number of Calls Lost’. Displays the average value of ringing time of all the calls to the Call Queue. Displays the ringing time of the call that rang for the longest time in the Call Queue. Agents screen displays the information of all the active and inactive agents. As a manager, you can activate/ deactivate an agent, set inbound and outbound call quotas, and upload/ edit an image for an agent. • The screen displays list of all the active and inactive agents associated to the group that you select from the Extension Group Name drop down list. • Only the user with ‘Manager’ role can view Agents screen. • You can create multiple agents (batch edits) before you save the data. • You can inactivate multiple agents (batch edits) before you save the data. 1. On the menu bar, click Agents. 2. 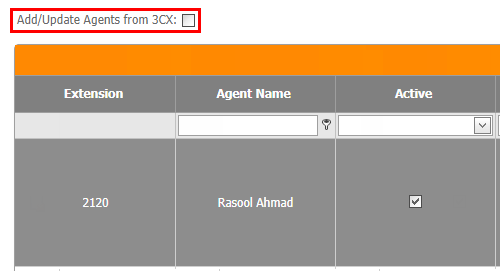 In the Agents screen, below tab bar, select Add/ Update Agent names from 3CX check box. 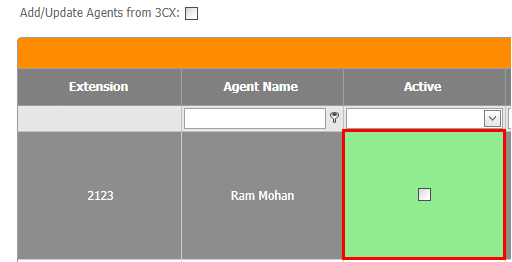 On checking the check box, the ‘Agents’ screen displays list of all the agents from 3CX. 3. Information message box appears. Click OK.
4. Refresh the screen to see the updated names in the Agent Name column. When you choose to update ‘Agent Names’ from 3CX, the system updates the values for all the Agents. 5. Check the Active box to activate the desired agent. 6. In the Outbound Calls Day Quota text box, type the number of calls an agent must make each day to meet their quota. 7. In the Outbound Calls Week Quota text box, type the number of calls an agent must make each week to meet their quota. 8. In the Outbound Calls Month Quota text box, type the number of calls an agent must make each month to meet their quota. 9. In the Inbound Calls Day Quota text box, type the number of calls an agent must attend each day to meet their quota. 10. In the Inbound Calls Week Quota text box, type the number of calls an agent must attend each week to meet their quota. 11. In the Inbound Calls Month Quota text box, type the number of calls an agent must attend each month to meet their quota. 12. From the Picture drop down, select the image that you want to display for the agent. 13. At the footer of the Agents screen, click Save changes to save the settings. 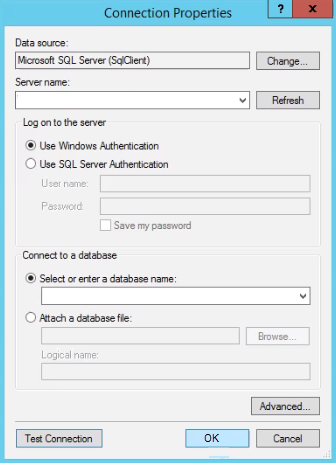 You can create multiple agents at one time, but make sure to click Save to commit all your changes to the database. 1. In the Agents menu option, from the Active column, check the box beside the agent whom you want to activate. To check if the agent is successfully activated, you can confirm by displaying the wallboard screen. The agent should display in the list of monitored agents. 1. In the Agents menu option, from the Active column, uncheck the box beside the agent whom you want to inactivate. 2. At the footer of the Agents screen, click Save changes. To confirm that the agent has been successfully inactivated, you can view the Wallboard screen. The inactivated agent should no longer display on the list of agents. 1. Select the Agents menu option, and identify the record of the agent for whom you want to change the quota. 2. If you want to edit inbound call quota, click Inbound Day Quota or Inbound Week Quota or Inbound Month Quota depending on the type of inbound quota that you want to edit. 3. Similarly, if you want to edit outbound call quota, click Outbound Day Quota or Outbound Week Quota or Outbound Month Quota depending on the type of outbound quota that you want to edit. 4. In the text field, type the new quota. 5. Click Save changes to save the new quota. 2. In the Picture column click the drop down to view the list of available images. 3. Select the previously uploaded image you want to associate with the agent. 4. Click Save changes to save and view the picture for the agent. 1. In the Agents menu option, on the top right corner, click Browse. 2. Browse to the image path. 3. Click Save changes to add the image to the picture drop down list. The Reports enable you to export data in various formats and view Agent Status report. 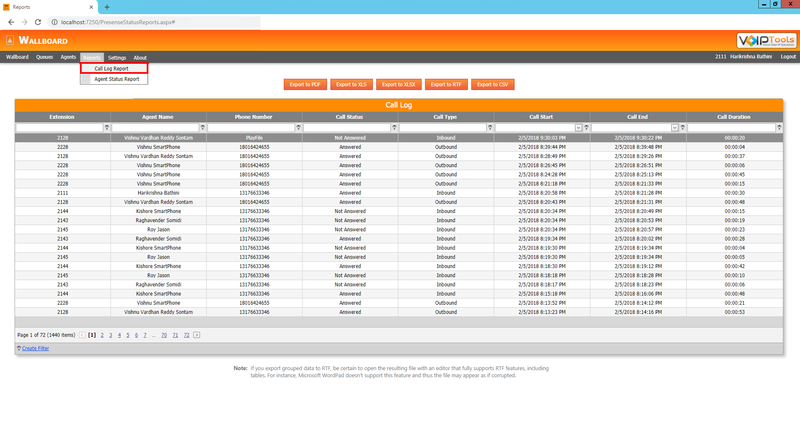 The Call Log Report screen enables you to export data in various formats. 1. Hover over the mouse on Reports tab and from the dropdown menu, select Call Log Report. Only the user with ‘Manager’ role can view ‘Reports’ screen. 2. The data represents call logs of all the agents. 3. Filter link on the left hand corner of the screen uses built-in query builder that enables you to filter call records by designing complex queries. The Call Log Report screen displays list of all the calls placed by the agents. You can also view the list of call records for a specific day by selecting the desired date in Call Start and Call End drop downs. The log contains details including ‘Agent Name’, ‘Extension’, ‘Call Status’, ‘Call Duration’ etc. As a manager, you can export the data in various formats including pdf, xls, xlsx, rtf or csv. 1. 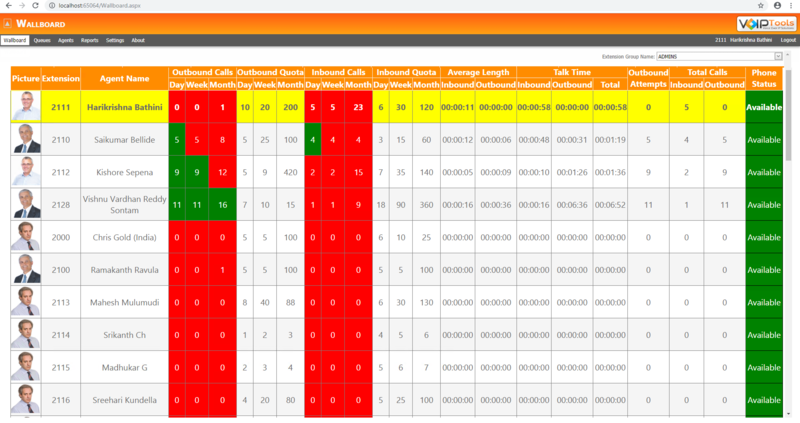 Hover over the mouse on Reports tab and from the dropdown menu, select Call Log Report to display the call log records. You can filter the data displayed or exported by entering criteria in the filter row. 2. Click appropriate export button to export the logs in your desired format. The Agent Status Report screen displays the history of the ‘Agent Status’ for all the agents. When an agent changes the status in the ‘3CX Smart Phone’, the status is instantly updated in the web portal. The updated status can be seen in the Presence Status column of the Wallboard screen. Each incident of the change in Presence Status for an agent is recorded individually in the Agent Status Report. The Settings screen enables you to select desired Extension Group Name for the Wallboard application. Based on the group name that you select here, the Wallboard and Agents screens will display data accordingly. 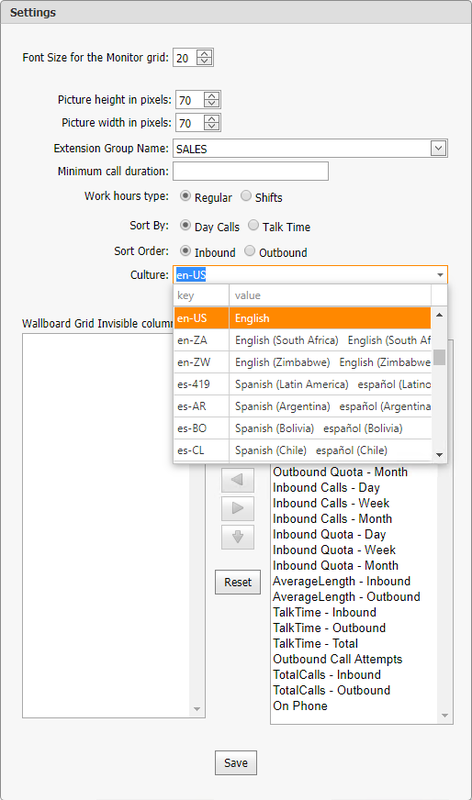 From Settings screen, you can also reorganize column order, control font size, column availability (making a column visible/ invisible), sort inbound or outbound call data for agents, and set minimum call duration in the Wallboard screen and these settings are applicable for all the groups associated to Wallboard application. The Minimum call duration enables you to set time in seconds after which a call that is made in the set Work hours type will stand eligible for call count. Only a user with the ‘manager’ role can view the Settings screen. You can increase or decrease the font size for wallboard screen so that when you display the agent information on flat screen TVs in prominent locations, the font will be visible to everyone from a farther distance. 1. On the Settings menu option and in the Settings dialog box, from the Font Size for the Monitor grid size box, increase or decrease the font size. 2. Click Save to save the font changes. You can resize the height and width of the agent’s image that appears on your wallboard screen. From the Picture height in pixels size box, type the pixel value or use the up and down arrows to increase or decrease the height respectively. From the Picture width in pixels size box, type the pixel value or use the up and down arrows to increase or decrease the width respectively. 2. Click Save to save the new picture resize values. • When you log into the web portal for the first time, you should save an extension group from the Extension Group Name drop down. Once you save the extension group, the wallboard screen automatically displays the active agents of that group. • Once an extension group is selected, only the manager of the selected 3CX extension group can view and access the complete web portal, while the agents of that group can only view Wallboard and About screens. • When you select a specific Extension Group Name in the Settings screen, the Extension drop down in the Agents screen lists all the extensions assigned to that group. 1. 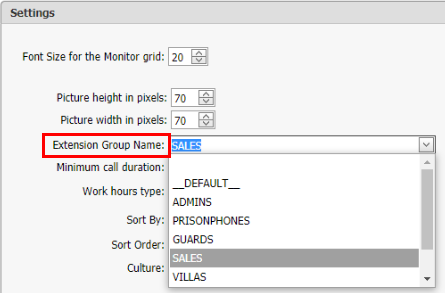 On the Settings dialog box, select the desired group from the Extension Group Name drop down. 2. Click Save to save the selected extension group. 1. On the Settings dialog box, in the Minimum call duration field, enter the time (in seconds) so that the outbound call that exceeds the set time will be eligible for call count. Calls that are made only during the set Work hour type will stand eligible for call count for any agent. On the Settings dialog box, beside Work hours type: label, select Regular option. 1. Beside Work hours type label, select Shifts option. 2. In the Shift start time field, set the time from which the shift starts. 3. In the Shift end time field, set the time at which the shift ends. Based on inbound/ outbound Sort Order setting, you can see that the Wallboard screen displays the agents in descending order based on their inbound/ outbound call count respectively. 1. On the Settings dialog box, beside Sort Order, select Inbound or Outbound option. Based on your requirement, you can hide either ‘Inbound’ or ‘Outbound’ columns or make both of them visible. If the Sort Order setting is Inbound, the Wallboard screen sorts the agents in descending order based on their inbound call count. Similarly, if the Sort Order setting is Outbound, the Wallboard screen sorts the agents in descending order based on their outbound call count. Culture controls how dates and currency should be displayed throughout 3CX Competitive Wallboard web portal. On the Settings dialog box, under Wallboard Grid Visible columns and Order list box, select the column that you want to reorganize in the wallboard screen and click or button to move the column to the left or right hand side respectively. 1. On the Settings dialog box, under Wallboard Grid Visible columns and Order list box, select the column that you want to hide in the Wallboard screen. 2. 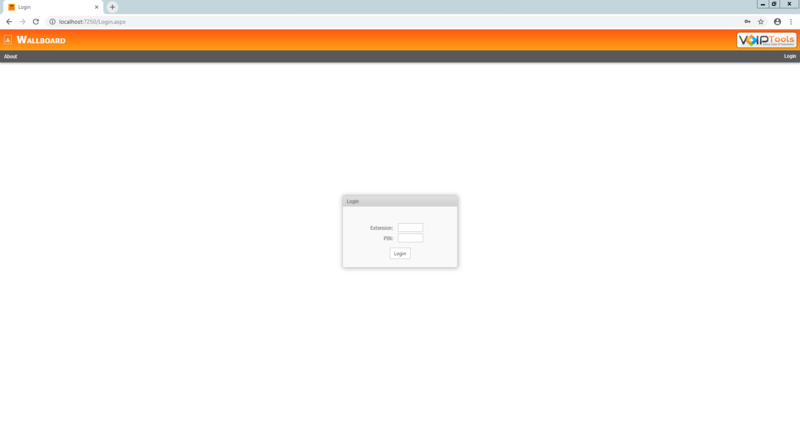 Click button to move it to the Wallboard Grid Invisible columns list box. 1. On the Settings dialog, under Wallboard Grid Invisible columns box, select the column that you want to make visible in the Wallboard screen. 2. 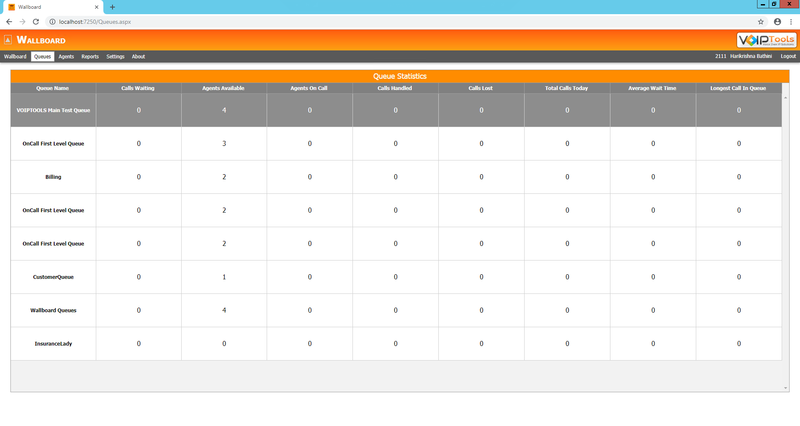 Click button to move it to the Wallboard Grid Visible columns and Order list box. A 3CX Extension Group is needed to identify which extensions should be monitored for outbound call activities. A Wallboard manager is created by assigning the ‘manager’ role to a specific extension in the extension group. You can create an extension group and assign multiple extensions to it. A single extension can exist in more than one extension group. 1. From the Extension list, select the extension that you want to add to the extension group that you just created and click Add. 2. 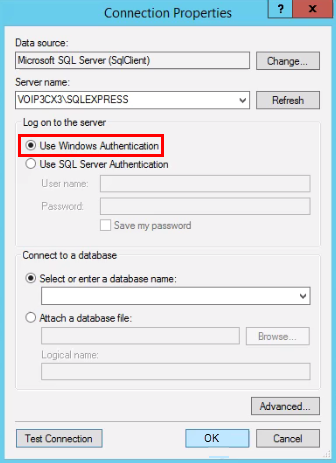 Repeat step 1 for all the extensions that you want to assign to the extension group.